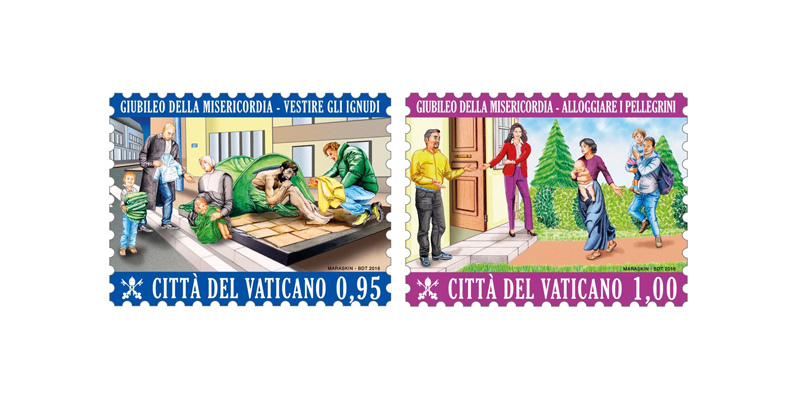 Continuing with the celebration of the Extraordinary Holy Year, the Philatelic and Numismatic Office presents the next two Corporal Works of Mercy: to clothe the naked and shelter the homeless. 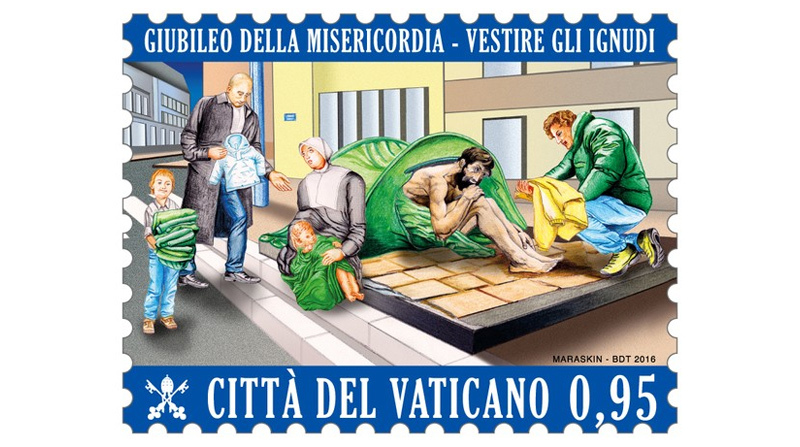 The first value of the postage stamp series, produced by French artist David Maraskin, depicts a group of adults and a child in a city context where they are donating clothing to a newborn and an adult who, naked and shivering, is seeking shelter under a tent. Nakedness is understood as both a lack of clothing and the impossibility of being present with others in a dignified way, which underscores how important it is to donate clothing. At the same time there exists another type of nakedness due to poverty and the lack of a roof over one’s head, a welcoming place which makes us feel at home. The precarious reality of living in a tent offers a visual and symbolic introduction to the next illustration where a young couple warmly opens the doors of their own home to a needy family, thereby offering hospitality and shelter. 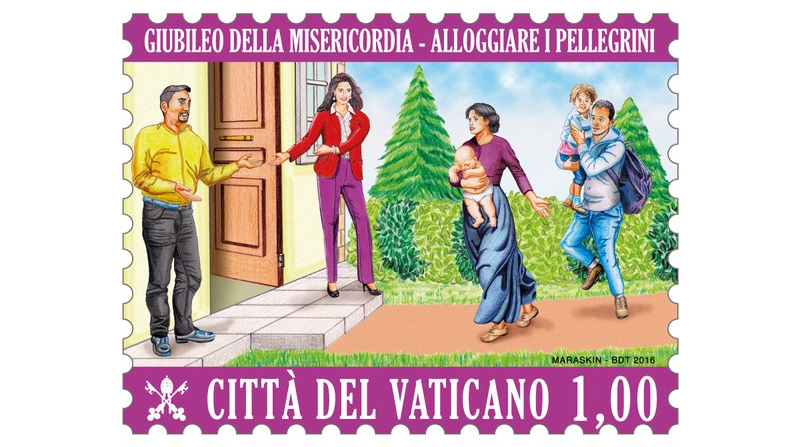 The Gospel of Matthew also teaches us that every act of mercy towards a person in need is an act of mercy for the Lord himself: “Then the king will say to those on his right, Come, you who are blessed by my Father. Inherit the kingdom prepared for you from the foundation of the world. For I was...a stranger and you welcomed me, naked and you clothed me...Then the righteous will answer him and say, Lord...When did we see you a stranger and welcome you, or naked and clothe you? ... And the king will say to them in reply, Amen, I say to you, whatever you did for one of these least brothers of mine, you did for me”(Mt 25).